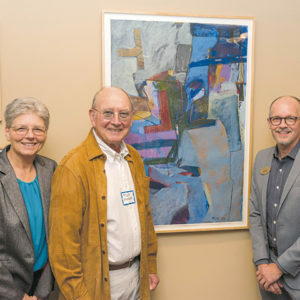 UCLA Emeriti Retiree Relations Center and Belmont Village Senior Living present “Conversations with Art” in separate exhibits at Belmont Village Westwood and Belmont Village Calabasas. The exhibits highlight the artistic talent of UCLA Emeriti retirees Sharon Belkin, Heather Campbell, John Edmond, Dorothea Frederking, Snehendu B. Kar, Barbara Lippe, Tino Mingori, Katalin Radics, Elaine Svenonius and Jill Waterman. UCLA Emeriti Retiree Relations Center Director Sue Barnes (left) joined Mingori and Belmont Village Executive Director James Arp at an opening reception at Belmont Village Westwood. Both galleries are open to the public, but is RSVP is requested to visit the Westwood gallery by calling (310)475-7501, and the Calabasas gallery at (818)222-2600. Read more on the Beverly Press.